Broski Berry Berry Series by Nasty Juice is the beryy fusion. Brewed with passion from the heart..
Sicko Blue Berry Series by Nasty Juice is the taste of freshly plucked raspberries right from th..
Stargazing Berry Series by Nasty Juice a light tug is all you need to be fully immersed in a fl..
One of the most sought-after fruity flavours worldwide market especially in the UK is brewed to perf.. Smooth summery atmosphere best describes the fresh honeydew flavour. The taste when inhaled is pleas.. This flavour is a genius blend of ripe mango and exotic mango of the East. The smell of mango is aro.. This time we come up with a widely favoured flavour, a mix of blackcurrant and lemonade that creates.. Mixture of Banana and Mango creates an elusive taste that will definitely blow your mind!The ta..
ombination on Mango and Grape will both creates a new unique yetexotic kind of flavor that wi.. Experience a wonderful taste from the world best strawberry. Just a drop of these lilbadass wil..
You’ll never find this one of the best fruity-taste of this mango flavore e-juice. The authentic.. Experience the goodness from this mild yet flavor apple e-juice. The just right of the sweetness.. This flavour contains a flavor ripe strawberry fruit freshly harvested from farm. You’ll be thri.. Nasty Juice are back again with the Nasty Ballin in a 60ml Hippie Trail is a lemon and lime flav.. Nasty Juice are back again with the Nasty Ballin in a 60ml short fill bottle. Migos Moon is a so.. Nasty Juice have created a new range of tobacco flavoured e-liquids. The Bronze Blend is a caramel .. Nasty Juice have created a new range of tobacco flavoured e-liquids. The Gold Blend is a tobacco fl.. 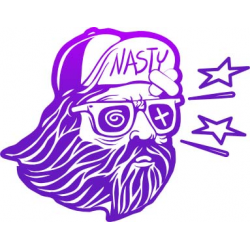 Nasty Juice have created a new range of tobacco flavoured e-liquids. The Silver Blend is a classic .. Pack of 3 pods ..